If you need proof of Everlast Services’ sheer breadth of skills, this is it. The client needed a full house makeover, and that’s exactly what we delivered. There’s no exaggeration involved when we say that we completely reinvigorated the house. 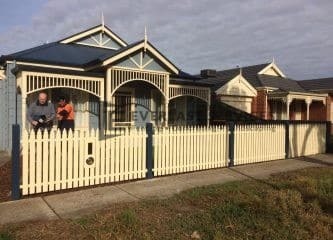 We started with the front of the house. 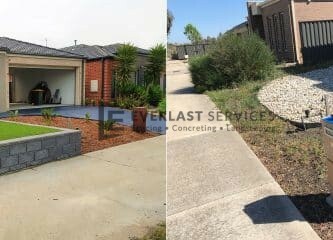 We used exposed aggregate for the driveway and paths. 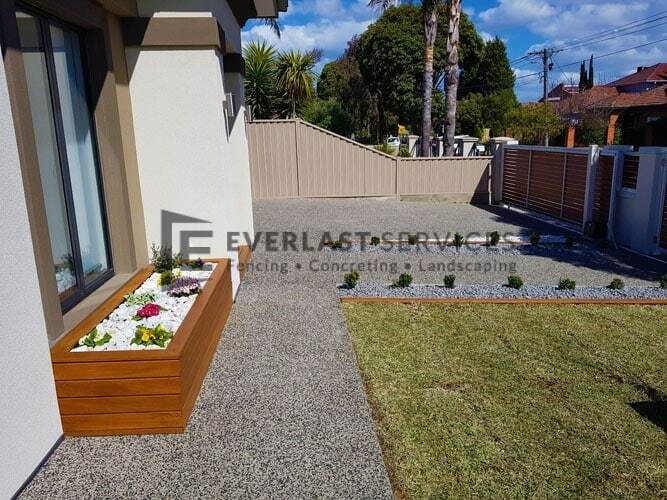 This gave the homeowner a cost-effective, durable, low-maintenance and non-slip material. 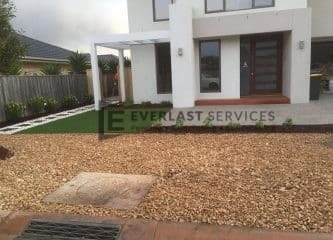 We then added turf to create a nice contrast with the concrete, with the whole look topped off by cumaru-cladded garden box. These garden boxes are the perfect addition to a home because they can grow and change with the house. The owners can replace the plants inside them, making them a living, breathing design piece. Cumaru is also an extremely strong timber. It will look good as new for decades, and only require a little bit of varnish every now and then. We also completed the pool landscaping for the home. 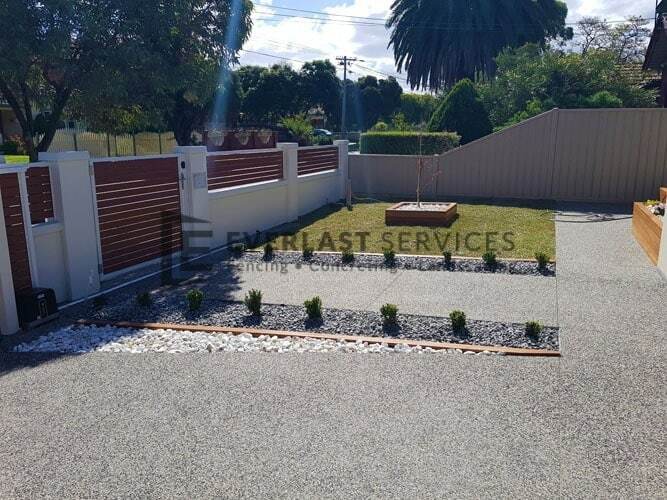 Firstly, we provided the paving and coping. We chose travertine because of its superior aesthetic and durability. The textured surface also makes it non-slip and perfect for pool surrounds. 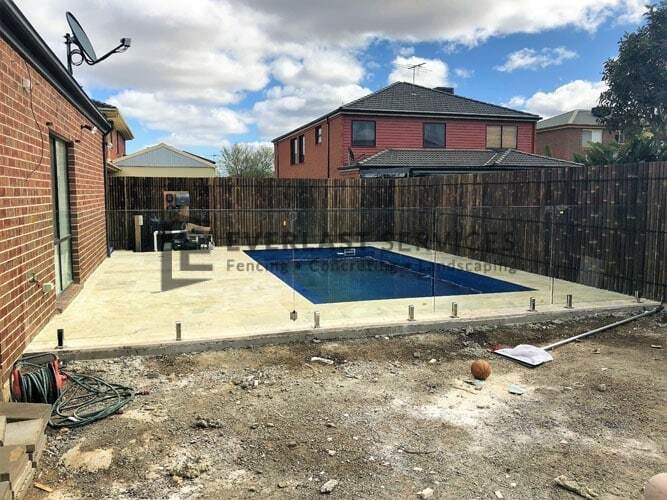 Every pool needs a fence, and we just knew this pool required a glass one. We love glass fencing because it offers the necessary safety, without blocking off the design piece of the backyard. 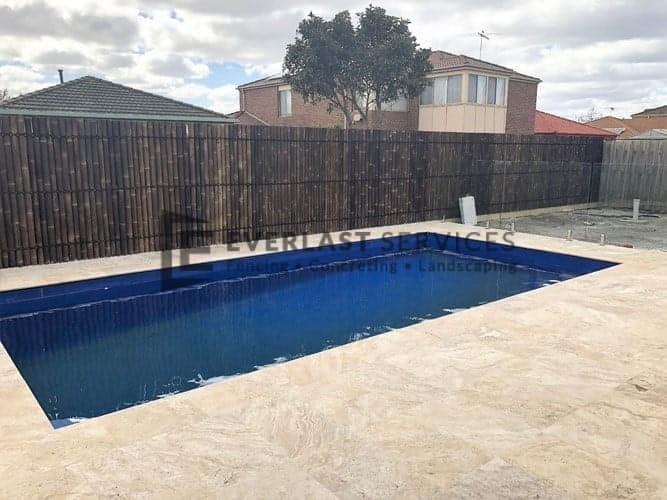 The whole look comes together perfectly, with the travertine making the pool water look azure blue, and giving the backyard a coastal, Mediterranean look. This project required almost the entire Everlast team, and they came together perfectly. We had the fencing team, working with the concreters, the landscapers and the pavers to deliver on the brief. The owners were absolutely thrilled with what we could produce and felt we turned their new house into a home. They also appreciated the fact that we chose cost-effective options and made the entire installation as low-maintenance as possible. 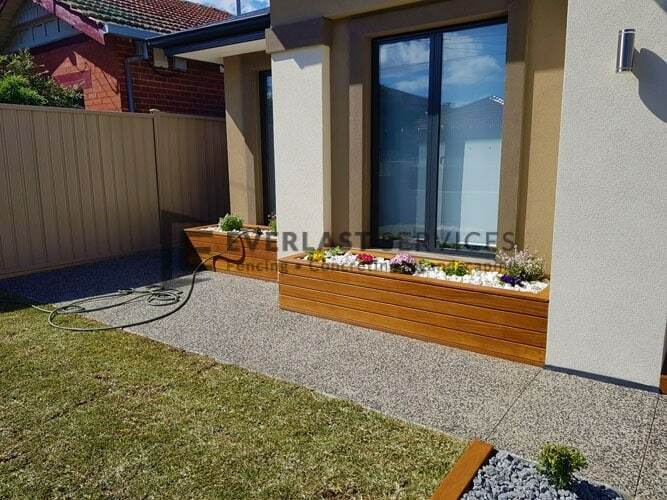 We don’t want anyone spending their weekends working away at their house, and the owners will be able to enjoy a beautiful back and front yard with very little work. If your house needs a bit of an uplift, why not get in touch with Everlast Services and organise a free, no-obligation quote.